The Dead Shall Be Raised is one of the many novels reissued, thanks to the British Library Crime Classics series. This is a lovely choice for Christmas reading, as it’s full of festive atmosphere. Published in 1942, this was George Bellairs’s fourth novel and the third published that year. It features his regular detective Inspector Thomas Littlejohn of Scotland Yard. The story begins on Christmas Eve 1940, as Littlejohn stepped from the well-lighted London to Manchester train into the Stygian darkness of the blacked-out platform of Stockport. The feeling of Britain during wartime is evident throughout the narrative, beginning with a vivid account of journeying in a dim, shadowy railway carriage on an unknown branch line at night. Inspector Littlejohn is on his way to be reunited with his wife. She is staying with an old friend in the north, after the windows of their London flat were blown out by bombing. His destination is Hatterworth, a town in the Pennines, surrounded by moorland. After missing the bus from the nearest station, Littlejohn is given a lift by a genial Superintendent Haworth, head of the local police. Hatterworth is full of Christmas spirit. The night was still crisp and frosty, with stars bright like jewels. In spite of the black-out, there were plenty of people astir in the darkness. Sounds of merry voices, shouts of goodwill and here and there groups of boys carol-singing at the doors of dwellings and holding noisy discussions concerning the alms doled out by their patrons in between their wassailing. There’s a delightful scene on Christmas night where a musical Superintendent Haworth is singing in a performance of The Messiah at the Methodist chapel, a big event for the town. Bellairs gives such an affectionate portrayal of a small community. Totally believable and full of charm, it’s like peering into the past. However effectively authors recreate a period setting, for me, nothing beats the writing of the time. It speaks to us across the decades. No worries about authenticity and research, the author was there. And the past is soon making itself remembered in Hatterworth. The Home Guard are busy on manoeuvres on Milestone Moor. The place was dotted with khaki-clad figures, running, leaping, stumbling, attacking, earnest in their mock-battling. While some of the men are laying a trench, they find a skeleton. A generation ago, two local men were murdered nearby. The killer was generally thought to be known but never found. The old investigation is re-opened and with a Scotland Yard man on the scene, Littlejohn happily agrees to assist. It’s a pleasure to follow the team’s intelligent, realistic gathering of evidence. Inspector Littlejohn is one of those determined, thoroughly decent policemen frequently encountered in pre-war crime fiction and the Hatterworth force are very well-drawn. Local knowledge proves invaluable as they question the witnesses still living. Bellairs writes some lovely sketches of country folk. His characters ‘leap off the page’ and have a feeling of real figures recalled. They hark back to a bygone age of country writing with farm labourers, gamekeepers, poachers and tramps. I loved the descriptions from the wild moorland with its lonely inns to the town’s foundrys and iron-workers. His sense of place is superbly done. If there’s any weakness in the plot, modern readers would probably point to a shortage of suspects – but this is such an engrossing read, that doesn’t matter. The story gradually becomes a how-do-we-nail-the-murderer? And how they do is very satisfying. The Dead Shall Be Raised is fascinating for its wartime atmosphere. The detectives’ wives are busy knitting scarves and balaclavas for the troops. Even a local tramp has his ration-books and identity-card. Apparantly the author was working as an air-raid warden at the time of writing. A timeless rural community has been forced to adapt, stoically and cheerfully. It’s poignant for the reader to know that way of life will never quite resume. 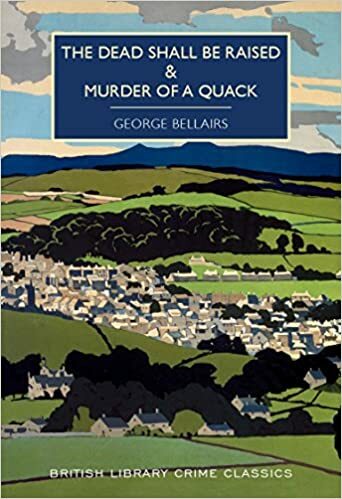 The British Library Crime Classics edition is extremely good value as The Dead Shall Be Raised comes with another Bellairs title The Murder Of A Quack, set in Norfolk. Though short novels by today’s standards, they’re not novellas but full-length mysteries. There’s also the bonus of an informative introduction by Martin Edwards. I’m a great fan of George Bellairs – the pseudonym of Harold Blundell (1902-82) – a bank manager and journalist who wrote over fifty detective novels. It’s pleasing to see his work readily available again and enjoyed by new readers. His writing has a real charm about it and this one is a perfect read for Christmas. I have had this on my to read pile for some weeks but hadn’t processed that it was set at Christmas. Based on that and your review I will make sure I get to it a little sooner than I had expected! Neither did I, it had been lurking on my pile for ages. Haven’t read Murder Of A Quack yet, looking forward to it. Pingback: The Dead Shall Be Raised by George Bellairs – Mysteries Ahoy! Thank you, best wishes for Christmas, John and Anne.